Hey, guys! We moved our blog. The new SampleSaleShop.com BLOG is located at Blog.SampleSaleShop.com. All of our previous posts from here, including World Cup Wednesdays, Splurge On ‘Em, and Sample Sale alerts, have been moved there, too. So come visit the new blog, bookmark it, comment, and enjoy it. Hope you dig the new layout! PS: Our Limited Edition LRG x G-Shock giveaway is on until this Thursday! We know y’all loved our last G-Shock giveaway, so we’re bringing it back by popular demand, offering a sweet, limited edition LRG x G-Shock watch. This contest is running through next Thursday – that’s 6/17 through 6/24 – and all you have to do to enter is request membership to our exclusive online sample sales and pop-shops with your favorite Streetwear brands & Street Art @ 50-80% off! And don’t forget to tell your friends to enter, because we’re giving everyone that signs up $5 towards their very first purchase with SampleSaleShop.com – totally free! And check out other fresh contests on Free Grechen here. In New York, we have the Mud truck in the East Village and taco trucks all over Williamsburg. This LA spin on the food truck is gonna fuse a few of SampleSaleShop.com‘s favorite things: fashion, art, technology and ice cream. 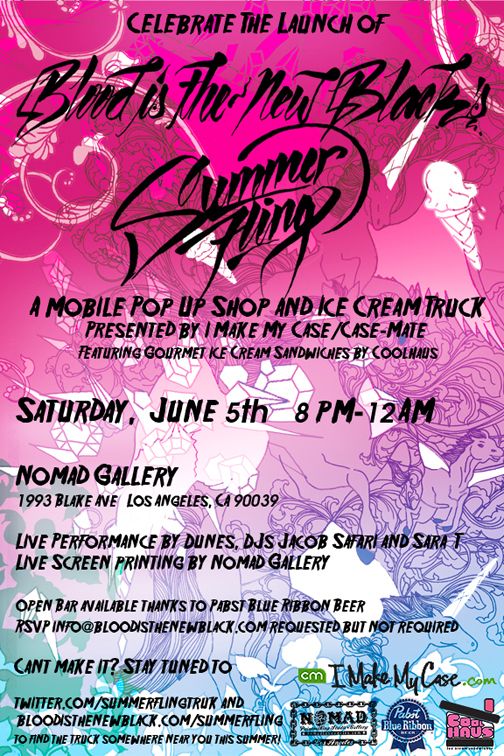 The Summer Fling Truck will be making the rounds in LA through September. If you’ve already signed up at SampleSaleShop.com, pick up a case-mate iPhone skin, and, who knows? Maybe you can stick it on the free unlocked iPhone you just might win from us! Sign up by June 21st to qualify. Hey, NYC ladies, Tracy Reese is having a sample sale next week: June 8 and 9. Details below. Yes, they WILL have spring items! Here are some pics from Tracy Reese’s spring/summer 2010 collection, plus Kim Kardashian, Selena Gomez, and even Michelle Obama, all rocking TR. The first 150 customers will receive a gift bag of full size beauty products. If you and Erin Fetherston are getting sick of the stud trend (check out all our posts featuring celebs rockin’ studded looks here), this Tracy Reese sale is most def for you! To get access to our own Pop-Shops (aka, online sample sales), sign up for free membership at www.SampleSaleShop.com. Don’t miss out on our give-aways! We’re giving away an unlocked iPhone, but to qualify, you have to sign up before June 21st. We also have a little more time left for our G-Shock watch give-away. Good luck. Hipster fantasy designer Erin Fetherston is a fave among indie stars like Kirsten Dunst and Zooey Deschanel. She is known for her cute, urban fairy-tale dresses. It came as a shocker when it was anounced that she’ll be creative consulting and guest designing for Juicy “Velour Tracksuit” Couture through 2011. We almost didn’t believe it, either, but then Erin wore this awesome Juicy (yes, Juicy!) dress to the 2010 Met Costume Institute Ball. It’s even in their signature velour. How does the Erin Fetherston aesthetic relate to Juicy Couture? The spirits of the brand cross over a bit. As a designer, I’ve always tried to balance a certain whimsy and playfulness with sophistication. And Juicy has such a fun-loving, irreverent spirit that I feel a lot of natural synergy between the two. What are your plans for the infamous tracksuit? The brand is celebrating the tenth anniversary of the tracksuit this year, so we’re offering a whole bunch of new variations on the theme — lots of different silhouettes. I’m doing a lot of fabric research right now. It’s great, because I’ll get to design the fun party dresses and take a crack at the iconic pieces. Any current trends you’re ready to see retired? I’ll be ready to see the studs and giant shoulder pads go. Will Erin Fetherston take the tracksuit outta the mall and into the streets? Does this water-down Erin’s “personal brand” (ahem, Carles from Hipsterrunoff)? Will the Real Housewives of The OC start dressing like Zooey Deschanel? Will Zooey D.’s long lost twin, Katy Perry (below, in Erin F.), be rockin the velour? Here’s Wendybird, a short film by Ellen von Unwerth, in which Kirsten Dunst finds a box of Erin Fetherston swag and lives happily ever after. Want SampleSaleShop.com swag? There’s just a few days left to enter our G-Shock watch Giveaway! To qualify, sign up at SampleSaleShop.com. You don’t wanna miss our iPhone Giveaway, either. Plus, there’s our video contest – show us your tracksuits, or whatever you love to wear. Don’t sleep on our SampleSaleShop.com iPhone Giveaway! “Unlocked” means it doesn’t come with a contract. Sooo, if you have a service that doesn’t offer the iPhone yet (ex: T-Mobile, Boost Mobile…), or you don’t wanna cancel and start a new contract, just stick in your sim card! 2. That’s it. That’s actually all you have to do. Hurry up, because the next 300 people must sign up by June 21st to qualify! PS: We’re picking the winners of our Nike and G-Shock give-aways soon! In the mean time, enter our video contest to score even more swag from us. Sign Up To Win a Free Unlocked iPhone! Request membership at SampleSaleShop.com by June 21st, and get the chance to win a FREE *unlocked* iPhone! What does “unlocked” mean? It means it doesn’t come with a contract. Sooo, if you have a service that doesn’t offer the iPhone yet (ex: T-Mobile, Boost Mobile…), or you don’t wanna cancel and start a new contract, this one’s for you! Hurry up n’ tell your friends, so you can be in the first 300! We’re picking the winners of our Nike and G-Shock give-aways soon! In the mean time, enter our video contest to score even more swag from us.